Palms Casino Resort in Las Vegas created a game for the Apple iPhone and Apple iPad which combines blackjack with Fantasy Football. In Fantasy Blackjack, the goal is to win the greatest amount of virtual currency from competing players within a blackjack league in order to be declared the winner at season’s end. Comparable to fantasy football leagues, the Palms Casino Fantasy Blackjack player can builds himself up as the “league commissioner” and allures contacts to join. Invitations can be distributed through iPhone contacts, Facebook, or e-mail. As commissioner, the player also determines season particulars, like the season’s length (maximum 90 days) and the season’s fundamental rules. In addition to being the commissioner, Fantasy Blackjack Players can also join multiple leagues or become a dealer. As dealer, the blackjack player configures the blackjack table rules, indicating how many decks are within the shoe, the minimum and maximum bet sizes, the payout on blackjack, whether and when players can double down, and when the dealer must hit. Players are able to browse available blackjack table to find the blackjack card games they prefer. Fantasy Blackjack initiates a new mobile casino gambling niche of “fantasy casino games”, which combines the communal thrill of social network games with the excitement of gambling. Moreover, players can see and feel the difference of wagering against other humans instead of a computer. Not least, the winning of digital dollars effects blackjack league placement on the leader boards, making the stake to the player’s ego more significant and gripping. 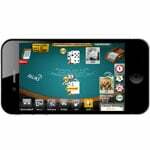 Unfortunately, as Apple App Store still does not allow real gambling applications, Palms Casino Fantasy Blackjack does not currently enable betting real money on the iPhone and iPad casino blackjack game. However, one may hope that with mobile gambling coming to Nevada, Palms Casino may launch a real money version of the blackjack card game for other mobile devices.